A worldwide shift towards the use of mobile devices coupled with recently-enacted data breach legislation has created a new challenge for IT organizations: balancing the enhanced productivity of mobile computing with the requirement to protect sensitive information from data breach. Many organizations have tackled mobile computer security with corporate policy, others with encryption technology. Both strategies are heavily reliant on end-user diligence to remain effective. 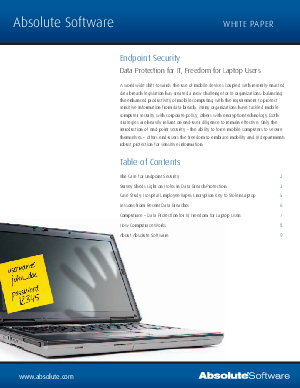 Only the introduction of end-point security - the ability to force mobile computers to secure themselves - offers end-users the freedom to embrace mobility and IT departments robust protection for sensitive information.